We have a gift to share with you! 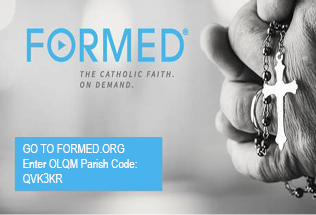 Our Lady Queen of Martyrs parish was given a subscription to FORMED so that every parishioner can have access to on-demand Catholic-inspired movies and video series, ebooks, and podcasts — including many programs available in Spanish. Stream programs to your computer or Android or iOS smartphones or tablets. And did we mention that it’s free! FORMED is a project of the Augustine Institute and Ignatius Press and offers programs from these trusted Catholic sources and many others. There is no cost to you to enjoy OLQM Church’s on-demand subscription. Click Enter Code and register using Parish Access Code: QVK3KR (case sensitive). Set up a personal profile for yourself (user name, email, password) for future log-ins. Start enjoying the best Catholic programming all in one place!